Cleaning stains off any kind of leather is a frightening task. Leather is fragile, and harsh chemical cleaners may fade the color or eat away at the leather. Removing glue, especially tough glue such as super glue or epoxy, is more difficult than removing other stains. Glue is made to last, not dissolve; epoxies are worse. They have two chemicals that combine when applied, and those chemicals form an impenetrable bond. The most common method to remove glue from leather is using acetone, but only use it as a last resort, because acetone is damaging to leather. Try essential oils or special leather cleaners first. 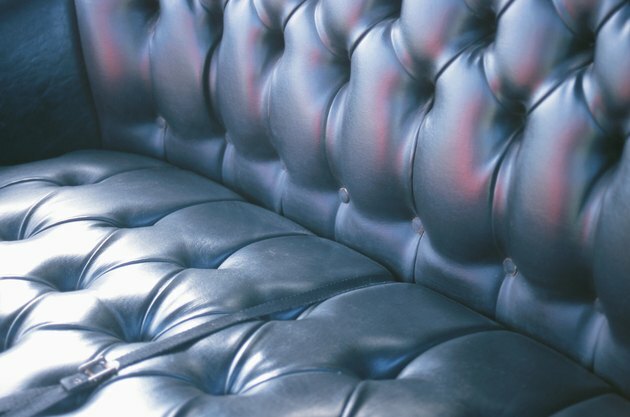 Leather seats are difficult to clean because chemicals can destroy the leather, especially if it is dyed. Wipe away as much glue as possible with the lint-free cloth if the glue is still wet. Catching the glue early makes the task easier. Place the smooth edge of the plastic knife against the edge of the hardened glue. Tilt the knife so that the edge points underneath the glue. Scrape the glue off the leather with the knife, but do not dig the knife into the leather. Scrape it gently across the top of the leather, but under the glue. Try to remove as much hardened glue as possible. Dip the cotton swab into the essential oil, coating the tip. Run the cotton swab over the hardened glue, pressing gently on the leather. Let the oil sit a few minutes to soften the glue. Wipe away the oil and glue with the cloth. Repeat if necessary. Mix the Klucel G powder with a small amount of alcohol to make a thick paste. Make sure the paste is thick. If the mixture is runny, add more powder. The paste should stick to a cotton swab and not fall off. Dip the cotton swab into the mixture, coating the tip. Rub the mixture over the glue, pressing gently on the leather. Let the paste sit for several minutes then wipe the paste and glue away with the cloth. Repeat, if necessary. Dip the cotton swab into acetone, coating the tip. Rub the acetone into the glue, but do not let the acetone touch the leather. Only apply acetone to the glue. Let the acetone sit for a few minutes. Dab the acetone and glue off the leather with the cloth. Do not wipe away the acetone, as it will spread it to the leather.